I listened to both doctors’ opinions and read up on the Internet. The patella tendon graft is more painful since they cut into your knee, but has a shorter recovery. The hamstring is a longer recovery but less painful. The patella doctor says the longterm prognosis is the same on both. The hamstring doctor thinks that you have better lasting knees for skiing with the hamstring—I went with the hamstring. A few people online also complained about numbness when kneeling with the patella. I am now six weeks post-surgery and a little jealous of the patella people; they’ll be running soon while I limp along. I don’t know if I made the right choice; I just know I had to make a choice and move forward. A few unlucky souls who don’t have the muscle strength need to have a cadaver graft and those have even harder adjustments. The surgery itself is painful—apparently anytime someone drills into your bones it hurts. 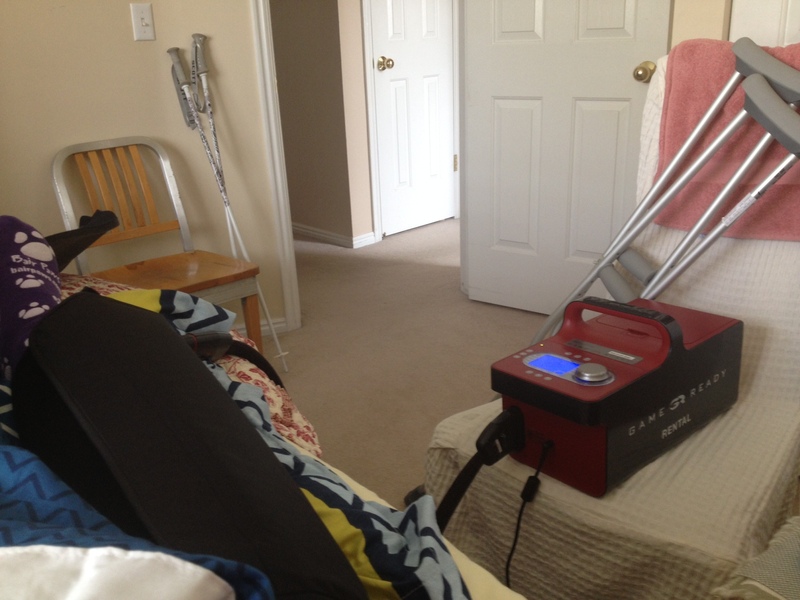 When I awoke up, I tried to move away from the pain but the five inches of padding around my knee, the ice machine brace and the regular brace kept me from moving too far. Any hope I had that I am tough under pain crumbled along with my dignity. I had to have a pain block sent into my vein to get it under control. After that came the fun part of trying to get dressed and to the car. I threw up and then again, a few more times in the driveway, and once in the hall at home. After surgery don’t expect to do anything for a week to ten days. I know you’ll say what I said. I’m independent; I’m tough. But all that toughness went out the window with the burning agony and another round of the vomits. I grabbed my mom’s hand and held it to my forehead. That set off a week of me being a big baby. She had to bring me food, help me to the shower, and change me (not my diaper, my ice machine). Oh, the ice machine, God’s gift for giving us weak ACLs. It’s this large pad you wrap around your leg and then plug it into a machine that pumps ice cold water through the pad while compressing your leg. Get one. It was almost a week before I could get around more than the bathroom and bed, 11 days before I could drive, and two weeks until I was back in the office (though I worked from home the second week). By lots of baggy shorts. Even post surgery, you’ll have to wear a brace for a while that can’t go over clothing. You will now enter a phase of life where you wear unattractive clothing and shoes. Stock up on Lorna Doones for when you throw up but still crave sugar. Accept for a few weeks you will be stupid. I don’t know if it’s the pain meds or the surgery but man I would just trail off mid-sentence. I had to spend some time my second week back at work fixing what I had done the first. Use this time to gain sympathy favors. Texas Roadhouse, books, movies, you’ve earned it. Get a handicap sticker. You don’t want to park in the farthest away spot, convince yourself it’s okay because walking is good for you, and then cry before your shopping trip is over. Above all else, go home to your mommy. Plugged into my miraculous ice machine. I felt a little like ironman but minus the riches and smarts.